Long-term memory (LTM) formation requires de novo gene expression in neurons, and subsequent structural and functional modification of synapses. However, the importance of gene expression in glia during this process has not been well studied. In this report, we characterize a cell adhesion molecule, Klingon (Klg), which is required for LTM formation in Drosophila. We found that Klg localizes to the juncture between neurons and glia, and expression in both cell types is required for LTM. We further found that expression of a glial gene, repo, is reduced in klg mutants and knockdown lines. repo expression is required for LTM, and expression increases upon LTM induction. In addition, increasing repo expression in glia is sufficient to restore LTM in klg knockdown lines. These data indicate that neuronal activity enhances Klg-mediated neuron-glia interactions, causing an increase in glial expression of repo. Repo is a homeodomain transcription factor, suggesting that further downstream glial gene expression is also required for LTM. Glia play critical roles in synaptic plasticity and memory formation by regulating neurotransmitter and ion concentrations in extracellular spaces, supplying energy sources and nutrients to neurons, and mediating activity-dependent morphological changes in synapses (Suzuki et al., 2011; Pannasch and Rouach, 2013; Zwarts et al., 2014). They also respond acutely to neuronal damage by inducing morphological changes required for axonal engulfment and clearance (MacDonald et al., 2006; Doherty et al., 2009). These functions demonstrate that glia can sense, and respond to, changes in neuronal states. However, while some glial proteins have been shown to be regulated by neuronal activity (Steward et al., 1991; Comas et al., 2004; Muthukumar et al., 2014), changes in activity of glia-specific transcription factors, upon neuronal stimulation or memory formation, have not been identified. In mammals and in other organisms, memories can be classified into various different forms. In general, short-lasting forms do not require de novo transcription and protein synthesis, while a longer lasting, consolidated form of memory, long-term memory (LTM), does (Buffington et al., 2014). Various transcription factors that are important for LTM formation have been found, and several of these, including CREB, NF-κB, and Notch, are expressed in glia as well as in neurons (Costa et al., 2005; Kaltschmidt et al., 2006; Alberini, 2009). However, previous research has focused on memory-dependent transcription/translation in neurons. We have been studying LTM in Drosophila using a Pavlovian olfactory associative paradigm. In this system, longer lasting consolidated types of memory are formed after multiple repeated training trials. Multiple repeated trials with 15 min rest intervals between trials (spaced training) forms protein synthesis-dependent LTM (Tully et al., 1994; Isabel et al., 2004), while multiple trials in succession without rest intervals (massed training) form a second type of consolidated memory, anesthesia-resistant memory (ARM). ARM can be distinguished from LTM because it does not last as long, and its formation is not suppressed by transcription or protein synthesis inhibitors (Tully et al., 1994). Previously we demonstrated that klingon (klg), a member of the Drosophila Ig superfamily of cell adhesion molecules (CAMs), is acutely required for LTM formation. Klg protein, but not mRNA, increases upon LTM induction (Matsuno et al., 2009). In this study, we show that Klg is required in both glia and neurons for LTM. We demonstrate that spaced training induces expression of a glial protein, Repo, and this induction depends on Klg expression in both cell types. Repo is a glial-specific, paired-like homeodomain transcription factor, which functions to activate glial differentiation and inhibit neuronal differentiation during development (Xiong et al., 1994; Halter et al., 1995; Yuasa et al., 2003). Repo is also expressed in adult brains, but its function in adults has been unclear. We show that training-dependent increases in Repo are important for LTM formation, and that artificially elevating Repo expression can rescue the LTM defects of klg mutants. These results indicate that acute increases in glial gene expression are required for LTM, and further suggest that Klg-mediated communication between neurons and glia is required for this increase. Flies were raised on standard medium at 25°C, 60% humidity, on a 12 h light/dark cycle, and an unselected mixture of 3- to 7-d-old male and female flies was used for all experiments in this study. w(CS10), derived from outcrossing w1118 to Canton-S for 10 generations, was used as the wild-type control (Dura et al., 1993). klgrus, klgGS10439, klgE226, hs-NΔcdc10, UAS-klgRNAi (klg36162) and w;hs-GAL4/CyO (Matsuno et al., 2009); NP6520 and NP1243 (Awasaki et al., 2008), 24B-GAL4 (Brand and Perrimon, 1993), the glial-geneswitch line, GSG3285–1 (Nicholson et al., 2008); and repo64 (Yuasa et al., 2003) have all been described previously. To construct UAS-repo-myc, a full-length repo cDNA, with an added Kozak consensus sequence, and three Myc-tags fused in tandem to the C terminus, were cloned into the pUAST vector (Brand and Perrimon, 1993). UAS-repoΔAD302 and UAS-repoΔHD-myc were generated in the same way except repoΔ302 and repoΔbox (Yuasa et al., 2003) were used in place of full-length repo. UAS-klgRNAi (III) (klg39515) was from the Vienna Drosophila RNAi Center, and other lines, including the UAS-repoRNAi line (repoTRiP. JF02974), were obtained from the Bloomington Stock Center (Indiana University). All lines, except 24B-GAL4, repo64, and repoEX84, were outcrossed to w(CS10) flies for at least six generations. All memory training and testing was performed in an environmental room maintained at 25°C and 60% humidity. Repetitive spaced and massed training were performed as described previously (Tully et al., 1994). Briefly, a single training session consisted of exposing ∼100 flies to CS+ and CS− odors for 1 min each, where CS+ odors were paired with 1.5 s pulses of 60 V DC electric shocks every 5 s, and CS− odors were not. 3-octanol and 4-methylcyclohexanol (Sigma-Aldrich) were used alternately as the CS+ and CS− odors. Spaced training consisted of 10 single-cycle trainings, with a 15 min rest interval between each training. Massed training consisted of 10 cycles of training, where one session immediately follows the previous one. After training, flies were stored in an 18°C incubator on a 12 h light/dark cycle until testing. A performance index was measured 1 d after training as an average of [(# of flies choosing the CS− odor) − (# of flies choosing the CS+ odor)]/total number of flies. For heat-shock treatment, collected flies were maintained in an 18°C incubator at least for 3 d before heat shock to minimize leaky expression. Flies were then transferred to preheated vials, which were submerged in a 37°C water bath for 30 min. Heat-shocked flies were returned to food vials at 25°C for a 6 h recovery period before training. For RU486 treatment, RU486 (mifepristone) was dissolved in ethanol, and mixed with fly food to a final concentration of 1% ethanol and 1 mm RU. Flies were fed RU486 for indicated periods of time. Cycloheximide (CXM) feeding was performed as previously described (Tully et al., 1994), except that flies were transferred to vials containing strips of Whatman filter paper soaked with 35 mm CXM and 5% sucrose for 16 h before training. For immunohistochemistry, 10 μm frontal paraffin sections of heads were cut and processed as previously described (Skoulakis and Davis, 1996; Crittenden et al., 1998). Antigens in paraffin sections were reactivated by heating for 10 min at 95°C in 10 mm sodium citrate, pH 6.0. Immunocytochemistry of cultured cells was performed as previously described (Su and O'Dowd, 2003). Two rabbit anti-Klg polyclonal antibodies were generated, anti-Klg-1, against a 20-mer peptide, PVPSIYWTKKSGANKSTARI, and anti-Klg-2, against a 26-mer peptide, CKGSGNPVPSIYWTKKSGANKSTARI, from the second Ig domain of the Klg protein. Antibodies were affinity purified using their peptide antigens, and both purified antibodies recognized the same size Klg band as described previously (Butler et al., 1997). Anti-Klg-2 antibody was used for immunohistochemistry and Western blots, and anti-Klg-1 antibody was used for immunocytochemistry experiments. Purified anti-Klg-1 was used at 1:50, purified anti-Klg-2 was used at 1:10, chick anti-GFP (Abcam) was used at 1:500, and mouse anti-Repo 8D12 (Developmental Studies Hybridoma Bank) was used at 1:20 for histology experiments. Topro-3 (Invitrogen) was used at 0.5 μm. The numbers of Repo-positive glia and the intensities of Repo staining were calculated using ImageJ (NIH; http://rsbweb.nih.gov/ij/). Primary pupal CNS cells were cultured as described previously (Miyashita et al., 2012). Cells were placed on concanavalin A laminin-coated glass coverslips and cultured in a 23°C humidified 5% CO2 incubator. Four-day-old cultured cells were used for antibody staining. Affinity-purified anti-Klg-2 antibody (1:20), monoclonal antibody against Repo (1:20; 8D12 from Developmental Studies Hybridoma Bank), and monoclonal anti-myc antibody (1:1000; 9B11 from Cell Signaling Technology) were used for Western quantification of Klg and Repo. Mouse anti-α-tubulin antibody (1:1000, #DM1a from Seikagaku Kogyo) was used for normalization. Head extracts were made in homogenization buffer [25 mm HEPES, 100 mm NaCl, 1 mm MgCl2, 1 mm CaCl2, 0.2% Trion X-100, 0.2% Nonidet P-40, and protease inhibitors (Roche)]. Signals were detected using HRP-conjugated secondary antibodies and ECL blotting reagents (GE Healthcare). Protein amounts were quantified using ImageJ. Total RNA from Drosophila heads was extracted using TRIzol reagent (Invitrogen), and cDNA was synthesized using RevTraAce (Toyobo) as described previously (Matsuno et al., 2009). Transcript amounts were quantified using real-time PCR (model 7500; Applied Biosystems). Expression of rp49 was used for normalization since rp49 amounts remain unchanged after spaced training (Miyashita et al., 2012). Primers used were as follows: repo-F: 5′-ACCATTTGGATCATGGCAGT-3′; repo-R: 5′-AACACATCTCATCGGGCTTC-3′; rp49-F: 5′-AGCATACAGGCCCAAGATCGTG-3′; and rp49-R: 5′-CGACAGCTTAGCATATCGATCC-3′. All data in bar graphs are means ± SEMs. Sample sizes are indicated within each bar in all graphs. Data were analyzed using the Student's t test for comparisons between two groups, and one-way and two-way ANOVA followed by indicated post hoc tests for multiple analyses. P ≤ 0.05 was considered statistically significant. Analyses were performed using Excel 2011 (Microsoft) with add-in software and Prism version 6.0 (GraphPad). We previously found that klingon (klg) is acutely required for olfactory LTM, and amounts of Klg protein increase upon LTM induction (Matsuno et al., 2009). To determine where Klg is localized in the Drosophila brain, we generated antibodies and observed Klg using immunohistochemistry. We observed discreet, punctate Klg signals throughout the brain in a pattern surrounding neuropil structures (Fig. 1A). This pattern suggested that Klg may be expressed on or near glia, and we examined colocalization between Klg and GFP expressed in either neurons (from an elav-Gal4 driver) or in glia (from a repo-Gal4 driver). Interestingly, we observed both overlapping and nonoverlapping Klg and GFP signals when GFP was expressed in either cell type (Fig. 1B,C), indicating that Klg is expressed in both neurons and glia, and may localize to the juncture between the two. We observed reduced Klg signals in brains of klgGS10439/klgE226 flies (Fig. 1D), and increased signals in the mushroom bodies (MBs) when klg was ectopically expressed using an MB driver (Fig. 1E, scab-GAL4/+;klgGS10439/+ flies), confirming the specificity of our antibody. To observe the cellular localization of Klg protein in more detail, we stained Drosophila primary cell cultures with Klg antibody and found that Klg is expressed in subsets of both neurons and glia (Fig. 1F,G). Since Klg is a CAM that forms homophilic interactions, this suggests that Klg may mediate neuron glial interactions required for LTM. Klingon (klg) expression in both neurons and glia is required for LTM. A, Klg immunostaining of an adult-head paraffin slice. A-1, Klg (magenta) is observed in a punctate pattern surrounding neuropil regions. GFP expressed in neurons (elav-GAL4/UAS-mCD8-GFP) is shown in green. EB, ellipsoid body; LAL, lateral accessory lobes; AMMC, antennal mechanosensory and motor center; SOG, subesophageal ganglion. A-2, Klg immunostaining alone. B-1, B-2, Higher magnification images of A-1 and A-2 that show that Klg and neuronal GFP staining patterns partially overlap (indicated by white arrows). C, Klg and GFP staining partially overlap when GFP is expressed in glia (UAS-mCD8-GFP/+; repo-GAL4/+). C-1, Staining with anti-Klg (magenta) and anti-GFP (green) antibodies. Areas of overlap are indicated with white arrows. C-2, Klg immunostaining alone. D, Klg amounts in wild-type (D-1) and in klgGS10439/klgE226 (D-2) flies. Compared with wild-type flies, klgGS10439/klgE226 flies show reduced Klg immunoreactivity. E, Klg amounts in scab-GAL4/+;klgGS10439/+ flies. When klg is expressed in the MBs under α-integrin (scab) promoter control, increased Klg immunoreactivity is observed in the MB lobes (data not shown) and calyces. F, G, Klg protein localization in Drosophila primary cell cultures. F, Partial overlap of Klg and synaptotagmin-GFP (syt-eGFP) signals in primary pupal CNS cultures from UAS-syt-GFP/+; elav-GAL4/+ brains. A subset of neurons expresses Klg (magenta). G, Partial overlap of Klg and GFP signals in primary pupal CNS cultures from UAS-mCD8-GFP/+; repo-GAL4/+ brains. Klg (magenta) is found in a subset of glia. H, klg knockdown in neurons and glia, but not muscles, inhibits LTM. One-way ANOVA indicates significant differences in memory between genotypes (F(12,103) = 15.91, p < 0.0001). *p < 0.05; ***p < 0. 001; ****p < 0.0001 versus both GAL4-alone and UAS-alone controls as assayed by Fisher's least significant difference tests. repo-GAL4 and nrv2-GAL4 express GAL4 in glia, elav-GAL4 expresses GAL4 in neurons, and 24B-GAL4 expresses GAL4 in muscle. I, Knockdown of klg in neurons and glia does not affect ARM. One-way ANOVA did not identify significant differences between genotypes (F(7,51) = 0.9758, p = 0.4589). J, Acute knockdown of klg in both neurons and glia inhibits LTM. klg was knocked down by expressing klg RNAi from neuronal and glial geneswitch drivers, and feeding flies 1 mm RU486 for 4 d at the adult stage. Two-way ANOVA identified significant differences due to genotype (F(4,85) = 3.435, p = 0.0119), RU feeding (F(1,85) = 30.56, p < 0.0001), and interaction between genotype and RU feeding (F(4,85) = 13.49, p < 0.0001). **p < 0.01 and ****p < 0.0001 compared with RU− controls, assayed by Bonferroni post hoc tests. To determine whether klg needs to be expressed in neurons, glia, or in both cell types for LTM, we next expressed klg-RNAi constructs from cell type-specific drivers. Knockdown of klg in both neurons and glia, using two independent klg-RNAi lines, inhibited LTM, whereas knockdown of klg in muscle had no effect (Fig. 1H). We previously showed that Klg is not required for a second type of consolidated memory, ARM, which is formed after massed training. Consistent with this, klg knockdown in neurons and glia had no effect on memory after massed training (Fig. 1I). To establish whether Klg is required during development, or acutely at the time of memory formation, we expressed klg-RNAi from RU486-inducible glial-GeneSwitch-Gal4 (GSG3285-1; Nicholson et al., 2008) or neuronal-GeneSwitch-Gal4 (elav-GS) drivers. Feeding adult flies 1 mm RU486, from 3 d before training until testing, disrupted LTM in both klg-RNAi/+; glial-GS/+ and klg-RNAi/+; elav-GS/+ flies, compared with nonfed controls (Fig. 1J).Our results suggest that an acute increase in Klg-mediated adhesion between neurons and glia after training is required for formation of LTM but not ARM. To further understand the function of Klg, we next characterized glial changes in klg mutants compared with wild-type. We first quantified glial cell numbers in wild-type and mutants by visualizing glia in head paraffin sections using antibody to the glial nuclear marker, Repo (Fig. 2A,B). Although we did not find a difference in numbers of glial cells, we noticed a significant decrease in intensity of Repo nuclear staining in klg mutants (Fig. 2C). We confirmed that Repo amounts are decreased in klg mutant and klg-knockdown heads by Western blotting (Fig. 2D). Previously we reported that klg expression is regulated by the Notch signaling pathway, and that Klg amounts are reduced upon expression of a dominant-negative Notch construct, NΔcdc10 (Matsuno et al., 2009). Consistent with this, we found that acute induction of NΔcdc10 also reduces Repo amounts (Fig. 2E). To determine whether Klg is regulated by Repo, we measured Klg protein in repo mutants and repo knockdown lines (Fig. 2F), and in transgenic flies overexpressing myc-tagged repo+ or a transcription-deficient version (repoΔHD-myc; Fig. 2G). We observed no significant changes in Klg amounts upon Repo manipulations, indicating that Klg regulates Repo, but not the converse. Interestingly, knockdown of klg in both neurons and glia caused similar decreases in Repo (Fig. 2D), indicating that neuronal Klg exerts a non-cell autonomous effect on glial Repo. klg mutants have reduced amounts of Repo. Repo immunoreactivity in adult-head slices from wild-type (A) and klgGS10439/klgE226 mutant (B) flies. A-1, B-1, Repo signals are shown in green, and nuclei (labeled with Topro) are shown in magenta. A-2, B-2, Black and white images of Repo immunoreactivity. A-3, B-3, Higher magnification images of the boxed regions in A-2 and B-2. C, Top, Quantification of the average Repo signal intensity/nucleus from seven wild-type (+/+) and klgGS10439/klgE226 mutant heads. Wild-type intensity was normalized to 1. **p < 0.01 as assayed by t test. Bottom, The number of Repo-positive nuclei/area is unaffected in klgGS10439/klgE226 mutants. D, Top, Representative western blot showing amounts of Repo in head extracts from wild-type (+/+), klgrus, and neuronal and glial klg knockdown lines (elav-GAL4/UAS-klg RNAi and nrv2-GAL4/UAS-klg RNAi). α-Tubulin (Tub) amounts are shown for comparison. Bottom, Quantification of western blot data. One-way ANOVA indicates significant differences between genotypes (F(3,26) = 16.02, p < 0.0001). ***p < 0. 001 and ****p < 0.0001 versus +/+ as assayed by Dunnett's multiple-comparison tests. E, Repo amounts decrease upon heat shock-dependent expression of dominant-negative Notch. Acute heat shock, 6 h before harvesting, reduces Repo in hs-NΔcdc10, but not wild-type heads. Two-way ANOVA identifies significant differences due to genotype (F(1,50) = 50.46, p < 0.0001), and interaction between heat shock and genotype (F(1,50) = 4.991, p = 0.03). Bonferroni post hoc comparisons demonstrate a significant difference in Repo amounts after heat shock in hs-NΔcdc10 heads (*p < 0.05), but no significant difference in wild-type. F, Western blots showing Repo, Klg, and Tubulin (Tub) amounts in wild-type (+/+), repo EX84/+, repo 64/+, and hs-GAL4/+; repoRNAi/+ head extracts. G, Western blots showing amounts of myc-tagged Repo, Klg, and Tubulin upon acute RU486-induced overexpression of myc-tagged repo or myc-tagged mutant repo (repoΔHD) in glial cells. Since Klg regulates Repo, we next examined whether Repo is required for LTM formation, and found that heterozygous repo loss-of-function mutants have significantly decreased 1 d memory after spaced training (Fig. 3A, left). This decrease consists of defects in LTM since feeding of a protein synthesis inhibitor, CXM, before training did not further reduce memory in mutants (Fig. 3A, right). One day memory after massed training is normal in both CXM-fed and control-fed repo mutants (Fig. 3B), indicating that repo mutants are defective for LTM, but not ARM, a phenotype similar to klg mutants. To address whether repo expression at the adult stage is required for LTM formation, we next acutely inhibited expression using a heat shock-inducible repo RNAi line. Repo protein amounts were significantly reduced 6 h after a 30 min 37°C heat shock in hs-GAL4/UAS-repoRNAi flies (Fig. 2F). The same heat-shock regimen performed 6 h before spaced training also significantly reduced 1 d memory in these flies, while it had no effect on control flies (Fig. 3C). 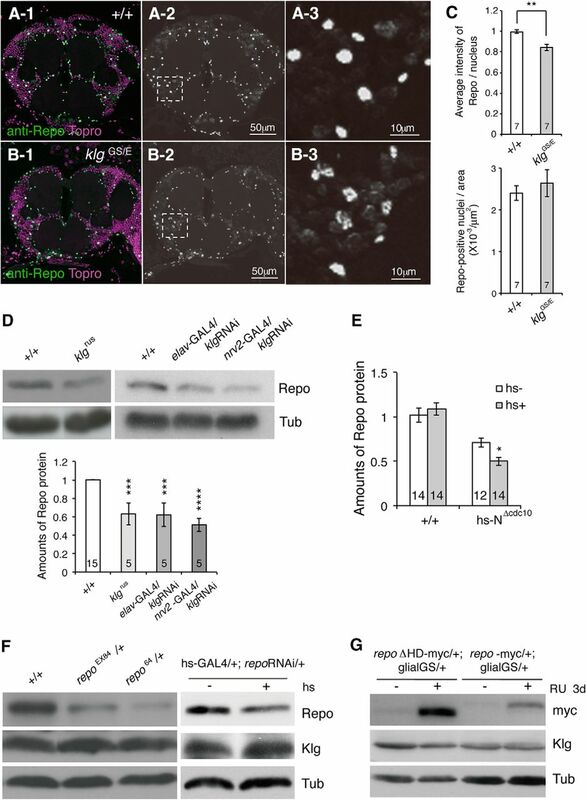 To discount the possibility of off-target effects of repoRNAi, we also inhibited endogenous Repo function by expressing a dominant-negative repo construct (repoΔAD302, containing a large deletion in its transcriptional activation domain), under control of the RU486-inducible glial-GS promoter. We found that feeding of 1 mm RU486, from 3 d before spaced training until testing, specifically disrupted 1 d memory in glial-GS>repoDN flies while it had no effect on controls (Fig. 3D). Repo is required for LTM formation. A, Left, repo hypomorphic mutants are defective for memory 24 h after spaced training. Experiments were performed comparing single mutants to wild-type. *p < 0.05; **p < 0.01 compared with +/+ by t test. Right, CXM treatment does not reduce 24 h memory in repo mutants. Two-way ANOVA indicates significant differences due to genotype (F(1,16) = 7.448, p = 0.0149), CXM feeding (F(1,16) = 22.90, p = 0.0002), and interaction between genotype and CXM feeding (F(1,16) = 5.639, p = 0.0304). Bonferroni post hoc tests reveal significant differences due to CXM feeding in wild-type (***p < 0.001), but not repoEX84 mutants. B, Left, 24 h memory formed after massed training. Right, Effects of CXM feeding on 24 h memory after massed training. C, Acute knockdown of repo disrupts LTM. A 37°C heat shock (hs+) for 30 min significantly disrupted 1 d memory after spaced training in hs-GAL4/+; UAS-repoRNAi/+ flies. Two-way ANOVA demonstrates significant differences due to genotype (F(3,43) = 9.189, p < 0.0001), heat-shock regimen (F(1,43) = 26.90, p < 0.0001), and interaction between genotype and heat shock (F(3,43) = 5.245, p = 0.0036). ****p < 0.0001 compared with hs−, determined by Bonferroni post hoc tests. D, Acute overexpression of dominant-negative repo in glia disrupts LTM. The glial-GS driver was used to overexpress dominant-negative repo in the presence of RU486 in a UAS-repoΔAD302/+; glial-GS-GAL4/+ line. RU486 (1 mm) was fed to flies from 3 d before training until testing. Two-way ANOVA indicates significant differences due to genotype (F(3,48) = 7.347, p = 0.0004), RU feeding (F(1,48) = 11.81, p = 0.0012), and interaction between genotype and feeding (F(3,48) = 8.020, p = 0.0002). ****p < 0.0001 compared with RU−, as determined by Bonferroni post hoc tests. E, repo knockdown in astrocyte-like glia (NP1243/+; repo RNAi/+) disrupts LTM, while knockdown in ensheathing glia (NP6520/repoRNAi) does not. One-way ANOVA indicates significant differences due to genotype (F(4,60) = 7.979, p < 0.0001). Tukey's multiple-comparison tests reveal significant differences between NP1243/+; repo RNAi/+ and both repoRNAi/+ and NP1243/+ controls (***p < 0.001), but no significant differences between NP6520/repoRNAi and the NP6520/+ control. In Drosophila, several different classes of glia have been characterized, including two types of neuropil glia: ensheathing glia, which are proposed to provide insulation between neighboring neural compartments, and astrocyte-like glia, which are thought to potentially associate with synapses (Awasaki et al., 2008; Doherty et al., 2009; Awasaki and Lee, 2011). To determine whether repo expression in a specific type of neuropil glia is required for LTM, we next knocked down repo in either ensheathing glia (using the NP6520 driver) or in astrocyte-like glia (from the NP1243 driver), and measured effects on 24 h memory after spaced training. We observed significant reductions when repo was knocked down in astrocyte-like glia compared with controls, while there was no difference when repo was knocked down in ensheathing glia compared with driver alone (Fig. 3E). Our results suggest that Repo-dependent gene expression is required acutely in astrocyte-like glia during LTM formation. During glial development, Repo is activated in differentiating glial cells through an increase in expression (Lee and Jones, 2005). To determine whether a similar type of regulation also occurs during memory formation, we next measured Repo amounts after training, and found a significant increase in Repo protein 24 h after spaced, but not massed, training (Fig. 4A). We also observed an increase in repo mRNA 24 h after spaced training (Fig. 4B), indicating that increases in Repo are likely to occur at the level of transcription. Repo amounts increase during LTM formation, and increasing repo expression is sufficient to rescue klg LTM defects. A, Amounts of Repo (normalized to α-tubulin) in fly heads increase after spaced training (one-way ANOVA, F(2,24) = 16.63, p < 0.0001), but not after massed training (one-way ANOVA, F(2,24) = 1.025, p = 0.3740). The increase in Repo becomes significant 24 h after training. ****p < 0.0001 and **p < 0.01 as assayed by Tukey's post hoc tests. B, Amounts of repo mRNA also increase after spaced training. **p < 0.01 versus naive by t test. C, Spaced training-dependent increases in Repo protein are not seen in klgrus, klgGS10439/klgE226, and neuronal (elav-GAL4/UAS-klg RNAi) and glial (nrv2-GAL4/UAS-klg RNAi) klg knockdown lines. Two-way ANOVA indicates significant differences due to genotype (F(4,102) = 14.51, p < 0.0001), time after training (F(2,102) = 3.197, p = 0.045), and interaction between genotype and time after training (F(8,102) = 2.180, p = 0.035). ****p < 0.0001 and ***p < 0.001 as determined by Bonferroni post hoc tests. D, Glial expression of repo is sufficient to rescue LTM defects of klg knockdown lines. Knockdown of klg using a glial-GeneSwitch driver (UAS-klg RNAi/+; glial-GeneSwitch-GAL4/+) in the presence of RU486 disrupts LTM. Glial expression of repo (UAS-klg RNAi/UAS-repo+; glial-GeneSwitch-GAL4/+) is sufficient to rescue this defect, while expression of an unrelated protein, GFP (UAS-klg RNAi/UAS-GFP; glial-GeneSwitch-GAL4/+), or expression of transcriptionally inactive repo lacking its homeodomain (UAS-klg RNAi/UAS-repoΔHD; glial-GeneSwitch-GAL4/+), does not. Two-way ANOVA indicates significant differences due to genotype (F(4,75) = 5.824, p = 0.0004), RU feeding (F(1,75) = 57.11, p < 0.0001), and interaction between genotype and feeding (F(4,75) = 9.168, p < 0.0001). ****p < 0.0001 and *p < 0.05 compared with RU− controls, as determined by Bonferroni post hoc tests. Spaced training-dependent increases in Repo parallel the spaced training-dependent increases in Klg protein that we reported previously (Matsuno et al., 2009). Thus, we next tested whether the increase in repo expression depends on Klg. Consistent with the results shown in Figure 2, Repo amounts in naive flies are reduced ∼2-fold in klg mutants and knockdown flies (Fig. 4C). In addition, spaced training-dependent increases are completely abolished in these mutants and knockdown flies, suggesting that training-dependent increases in Klg-mediated neuron glia adhesion are responsible for increasing Repo expression. Since Repo is required for normal LTM, we next considered the possibility that reduced Repo could be the cause of LTM defects in klg mutants. Thus we measured LTM in klg knockdown flies and in knockdown flies expressing a repo transgene in glia. As seen in Figure 4D, glial expression of a wild-type repo transgene is sufficient to rescue the LTM defects of klg knockdown flies. Expression of a nonfunctional repo transgene lacking its homeobox DNA-binding domain (repoΔHD), or expression of an unrelated protein, GFP, does not rescue these defects, indicating that rescue depends specifically on transcriptionally active Repo. These results suggest that training-dependent strengthening of neuron glia adhesion increases expression of glial Repo, and this increase is sufficient for normal LTM. Many changes in gene expression during LTM induction and long-term plasticity have been characterized, including activation of various immediate early genes (Alberini, 2009). Although several of these genes are expressed in both glia and neurons, data showing activity-dependent changes in expression specifically in glia have not been previously reported, and most plasticity models focus on changes in neurons. Here we show that spaced training increases repo gene expression and protein amounts, and that LTM requires Repo activity. Repo functions during development to activate glial differentiation and inhibit neuronal differentiation, but it is also expressed in adults, and is used extensively as a glial marker. Our data indicate that an acute increase in glial transcription occurs to increase Repo amounts during LTM formation. Since Repo itself is a transcriptional activator, our data further suggest that a cascade of glial transcription may be required during LTM formation. In neurons, various steps are involved in inducing LTM-associated transcription (Pláteník et al., 2000). Neuronal activity induces postsynaptic depolarization, resulting in Ca2+ influx, and activation of second messengers. Second messengers, in turn activate pre-existing transcription factors, which then induce expression of downstream effector genes, including additional transcription factors. While the steps involved in inducing glial gene expression are still unclear, we demonstrate that LTM-associated increases in Repo require the CAM, Klg. Klg amounts, on the other hand, are unaffected by alterations in Repo activity, indicating that Repo functions downstream of Klg. Supporting this idea, glial expression of a repo transgene is sufficient to rescue klg LTM defects, suggesting that the primary function of Klg during LTM formation is to induce training-dependent glial repo expression. Klg is found at the juncture between neurons and glia, and needs to be expressed in both of these cell types to induce repo expression and LTM formation. Thus neuronal Klg functions non-cell autonomously, while glial Klg functions cell autonomously, to induce repo. Since Klg is a cell adhesion that forms homophilic interactions, we propose that neuron-glia Klg interactions transmit information about neuronal activity to glia. We have previously shown that amounts of Klg protein, but not mRNA, increase upon LTM induction (Matsuno et al., 2009). 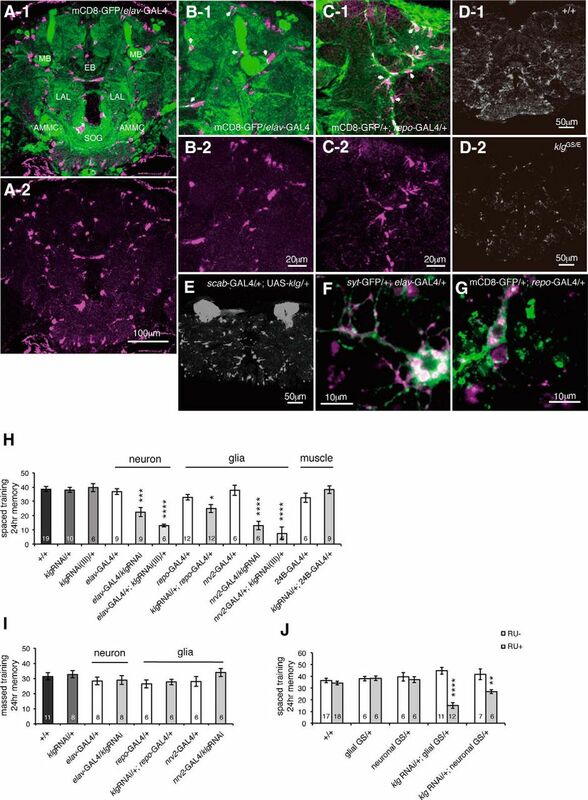 This increase may directly enhance neuron glial signaling, or alternatively, may enhance neuron glial adhesion, causing increased repo expression through an indirect mechanism. We do not believe that Repo functions at the apex of a transcription cascade during LTM formation because expression of repo itself increases after spaced training. Instead, we propose that a pre-existing glial transcription factor is activated by Klg, and increases repo expression. Repo then functions as a downstream effector molecule, regulating expression of a variety of glial genes further downstream that are required for LTM. Previous studies have tried to identify where proteins are synthesized during LTM formation. In particular, Chen et al. (2012) did not observe a decrease in LTM when protein synthesis was acutely inhibited in repo-expressing cells. While these data seem inconsistent with ours, when Chen et al. (2012) inhibited protein synthesis using a second glial driver derived from the crammer gene, LTM was severely impaired. Thus it is possible that the repo driver used by Chen et al. (2012) may not have inhibited synthesis enough to affect LTM. What downstream genes does Repo control? Learning-induced changes in nuclear RNA were reported >50 years ago (Hyden and Egyhazi, 1962), and these occur in both neurons and glia. Surprisingly, however, very few glial effector genes showing altered expression upon memory formation have been identified. In mammals, amounts of a glial Ca2+ binding protein, S100β, have been reported to increase upon memory formation (Hydén and Lange, 1970), while in Drosophila, expression of crammer (cer), which encodes an inhibitor of the cathepsin family of cysteine proteinases, has been reported to decrease after spaced training (Comas et al., 2004). cer is found in both neuropil and glia, but it is thought to exert an effect on LTM in glia. A Drosophila homolog to S100β has not been identified, and decreased cer expression occurs 3 h after training, before Repo increases. This suggests that S100β and cer are not regulated by Repo. Recently, various genes regulated by Repo have been identified, and several of these, including members of the wnt/wingless signaling pathway, have been shown to affect synaptic structure and efficacy (Kerr et al., 2014). It will be of great interest to determine whether these or other genes are also components of a training-induced glial transcription pathway required for LTM. This work was supported by the Ministry of Education, Culture, Sports, Science and Technology (MEXT) KAKENHI grants 21700425 and 24700415 to M.M. ; MEXT KAKENHI Grant 23500394 to J.H. ; and MEXT Grants-in-Aid for Scientific Research on Innovative Areas “Memory Dynamism” (25115006) and Scientific Research (A) (25250010) to M.S. We thank Yasushi Hiromi for helpful discussions and comments, Haig Keshishian (Yale University, New Haven, CT) for GSG3285-1, Emiko Suzuki (National Institute of Genetics, Japan) for 24B-GAL4, and Takeshi Awasaki (Kyorin University, Japan) for NP6520 and NP1243. Other Drosophila lines and antibodies were obtained from the Vienna Drosophila RNAi Center, the Bloomington Stock Center, and the Developmental Studies Hybridoma Bank. (2009) Transcription factors in long-term memory and synaptic plasticity. Physiol Rev 89:121–145, doi:10.1152/physrev.00017.2008, pmid:19126756. (2011) New tools for the analysis of glial cell biology in Drosophila. Glia 59:1377–1386, doi:10.1002/glia.21133, pmid:21305614. (2008) Organization and postembryonic development of glial cells in the adult central brain of Drosophila. J Neurosci 28:13742–13753, doi:10.1523/JNEUROSCI.4844-08.2008, pmid:19091965. (2014) Translational control in synaptic plasticity and cognitive dysfunction. Annu Rev Neurosci 37:17–38, doi:10.1146/annurev-neuro-071013-014100, pmid:25032491. (1997) klingon, a novel member of the Drosophila immunoglobulin superfamily, is required for the development of the R7 photoreceptor neuron. Development 124:781–792, pmid:9043060. (2012) Visualizing long-term memory formation in two neurons of the Drosophila brain. Science 335:678–685, doi:10.1126/science.1212735, pmid:22323813. (2004) Drosophila long-term memory formation involves regulation of cathepsin activity. Nature 430:460–463, doi:10.1038/nature02726, pmid:15269770. (2005) Notch to remember. Trends Neurosci 28:429–435, doi:10.1016/j.tins.2005.05.003, pmid:15922461. (1998) Tripartite mushroom body architecture revealed by antigenic markers. Learn Mem 5:38–51, pmid:10454371. (2009) Ensheathing glia function as phagocytes in the adult Drosophila brain. J Neurosci 29:4768–4781, doi:10.1523/JNEUROSCI.5951-08.2009, pmid:19369546. (1993) Identification of linotte, a new gene affecting learning and memory in Drosophila melanogaster. J Neurogenet 9:1–14, doi:10.3109/01677069309167272, pmid:8295074. (1995) The homeobox gene repo is required for the differentiation and maintenance of glia function in the embryonic nervous system of Drosophila melanogaster. Development 121:317–332, pmid:7768175. (1962) Nuclear RNA changes of nerve cells during a learning experiment in rats. Proc Natl Acad Sci U S A 48:1366–1373, doi:10.1073/pnas.48.8.1366, pmid:14450327. (1970) S100 brain protein: correlation with behavior. Proc Natl Acad Sci U S A 67:1959–1966, doi:10.1073/pnas.67.4.1959, pmid:4923122. (2004) Exclusive consolidated memory phases in Drosophila. Science 304:1024–1027, doi:10.1126/science.1094932, pmid:15143285. (2006) NF-kappaB regulates spatial memory formation and synaptic plasticity through protein kinase A/CREB signaling. Mol Cell Biol 26:2936–2946, doi:10.1128/MCB.26.8.2936-2946.2006, pmid:16581769. (2014) Glial wingless/Wnt regulates glutamate receptor clustering and synaptic physiology at the Drosophila neuromuscular junction. J Neurosci 34:2910–2920, doi:10.1523/JNEUROSCI.3714-13.2014, pmid:24553932. (2005) Transcriptional regulation of the Drosophila glial gene repo. Mech Dev 122:849–862, doi:10.1016/j.mod.2005.01.002, pmid:15939231. (2006) The Drosophila cell corpse engulfment receptor Draper mediates glial clearance of severed axons. Neuron 50:869–881, doi:10.1016/j.neuron.2006.04.028, pmid:16772169. (2009) The Drosophila cell adhesion molecule klingon is required for long-term memory formation and is regulated by Notch. Proc Natl Acad Sci U S A 106:310–315, doi:10.1073/pnas.0807665106, pmid:19104051. (2012) Mg(2+) block of Drosophila NMDA receptors is required for long-term memory formation and CREB-dependent gene expression. Neuron 74:887–898, doi:10.1016/j.neuron.2012.03.039, pmid:22681692. (2014) Activity-dependent regulation of astrocyte GAT levels during synaptogenesis. Nat Neurosci 17:1340–1350, doi:10.1038/nn.3791, pmid:25151265. (2013) Emerging role for astroglial networks in information processing: from synapse to behavior. Trends Neurosci 36:405–417, doi:10.1016/j.tins.2013.04.004, pmid:23659852. (2000) Molecular mechanisms associated with long-term consolidation of the NMDA signals. Life Sci 67:335–364, doi:10.1016/S0024-3205(00)00632-9, pmid:11003045. (1996) Olfactory learning deficits in mutants for leonardo, a Drosophila gene encoding a 14–3-3 protein. Neuron 17:931–944, doi:10.1016/S0896-6273(00)80224-X, pmid:8938125. (1991) Neuronal activity up-regulates astroglial gene expression. Proc Natl Acad Sci U S A 88:6819–6823, doi:10.1073/pnas.88.15.6819, pmid:1862105. (2003) Fast synaptic currents in Drosophila mushroom body Kenyon cells are mediated by alpha-bungarotoxin-sensitive nicotinic acetylcholine receptors and picrotoxin-sensitive GABA receptors. J Neurosci 23:9246–9253, pmid:14534259. (2011) Astrocyte-neuron lactate transport is required for long-term memory formation. Cell 144:810–823, doi:10.1016/j.cell.2011.02.018, pmid:21376239. (1994) Genetic dissection of consolidated memory in Drosophila. Cell 79:35–47, doi:10.1016/0092-8674(94)90398-0, pmid:7923375. (1994) repo encodes a glial-specific homeo domain protein required in the Drosophila nervous system. Genes Dev 8:981–994, doi:10.1101/gad.8.8.981, pmid:7926782. (2003) Drosophila homeodomain protein REPO controls glial differentiation by cooperating with ETS and BTB transcription factors. Development 130:2419–2428, doi:10.1242/dev.00468, pmid:12702656. (2014) Glia in Drosophila behavior. J Comp Physiol A:1–15, doi:10.1007/s00359-014-0952-9.